Paul & Jill's Horseback Riding Equestrian Stable and Tours, Inc.
Paul and Jills Equestrian Stables, St Croix from simonb3d on Vimeo. 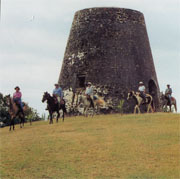 Sugar mills, moko jumbies and mongoose share St. Croix, the largest island of the U.S. Virgin Islands, with Paul & Jill's Equestrian Stables. In a land of history and cultural traditions, the equine enthusiast can enjoy an informative cross-country ride with Jill as your guide. Born and raised on St. Croix, Jill has been riding the hills for years and can tell you about the history of the islands as well as its inhabitants - both plants and animals. 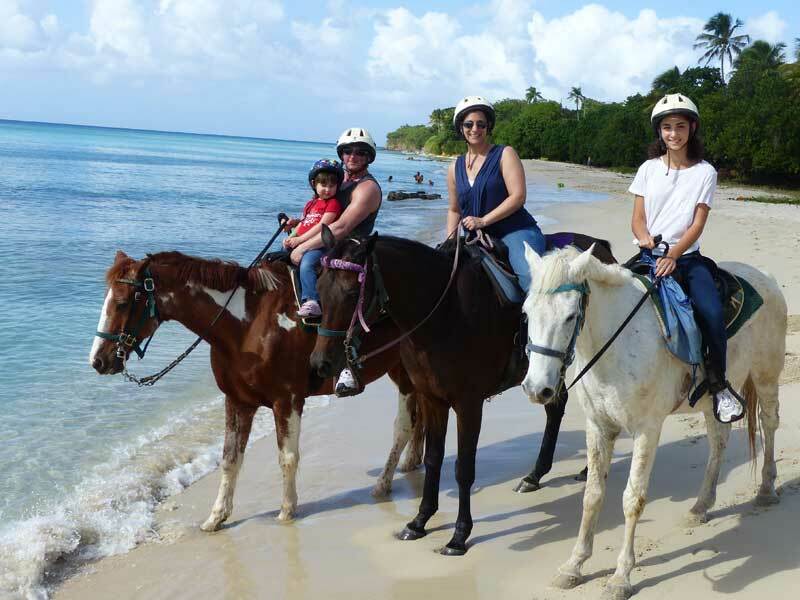 During a January visit to St. Croix, my husband, Doug and I spent a morning with Jill on a rain forest nature tour along trails through fields and woods with Linda from Nebraska and Ann and Jim from Arkansas on well-trained island horses of all different colors. Jill loves the variety of colors in horses and seems to have at least one of each, including several pintos, in her herd of thirty-three, many of which she bred and trained herself. I rode a large chestnut and white pinto named Mr. MacGregor while Doug was on Fortune, a quiet bay. 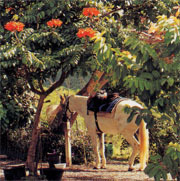 Pancho, another chestnut and white pinto, and Dottie, a flea-bitten gray were two of the other horses that waited patiently for us underneath a large African tulip tree with its bright orange flowers. Far from Christiansted and Frederiksted with their winding, narrow streets bustling with tourists from the massive cruise ships docked nearby, we seemed to be part of another world. All that mattered was our horses and the laid back feeling of a quiet ride in the country. Trade winds and an occasional shower cooled the warm tropical air. We followed Jill as she led us up a country lane, listening to her descriptions of the various island novelties. "See that large brown mass around the crotch of that tree? Termite nest," she explained as she pointed to a knobby brown growth, easily three times the size of a basketball. "There's a millipede!" she said a few minutes later pointing to a four-inch-long black worm-like creature, slowing inching up a tree trunk, its tiny legs wiggling under its long cylindrical body. Jill told us about the Mother's Tongue Tree with yellow seed pods that chatter in the wind and the kapok tree, whose pods once provided silk cotton for stuffing in pillows and life jackets. She showed us a West Indian almond tree, an avocado tree, papaya trees, mahogany and teak trees, and a large majestic zebra butterfly with green and black stripes. Veering off the narrow country road we trotted along a hard dirt trail that curved and snaked through the forest, dark green hills and Blue Mountain looming above us in the distance. Leaving the trail, we rode through large overgrown pastures where Jill continued to show us some of the native plant and animal life - many with local descriptive names, such as the monkey-no-climb tree with its trunk bristling with thorns, the touch-me-not bush that has leaves with a prickly underside or the catch-and-keep vine that sticks to everything. We saw hummingbirds, a mongoose and long thick vines for those who wanted to try their hand playing Tarzan. She pointed out a poisonous plant in which one red seed can kill a person and three can kill a horse. Several cattle egrets perched in a tree in one of the pastures looking like large white blossoms scattered among the branches. We rode toward them and found a small herd of some of Jill's other horses beneath the tree resting. The egrets were waiting for the horses to start grazing again so they could feast on the insects that the horses stirred up in their quest for the tastiest blades of grass. We rode underneath a huge rain tree, its massive canopy of branches dwarfing the horses. Riding to the crest of a hill, we circled the remains of one of the island's more than 100 sugar mills used during the sugar cane plantation era. The view of the tropical coastline - the deep blue of the Caribbean contrasting with the bright green of the island - was breathtaking. We finished our ride by winding our way back down to our starting point through Paul and Jill's orchard. Available at various times for riders to pick are a variety of tropical fruit - lemons, carambola, soursop, guava, tangelos, grapefruits, oranges, bananas, breadfruit, calabash, mangoes, and three kinds of palms - Royal, Christmas, and Coconut. After our morning horseback adventure we took a tour of the adjacent Sprat Hall Plantation, the only French-build Great House and the oldest on St. Croix, dating back to 1654, before heading down to lunch on the beach at the Sprat Hall Beach Restaurant. The beach there is lovely and appeared to be a good swimming spot. The next afternoon Doug and I took a catamaran out to Buck Island, a National Park, to snorkel the underwater nature tour there. We saw an exciting array of tropical fish - parrot fish, grunts, striped dog fish, needle fish, angel fish and many more we couldn't begin to name. We saw a huge - several hundred - school of brilliant blue tangs swimming together like an iridescent scarf weaving in and out of the forest of antler coral and sea fans. A large hawksbill sea turtle lazily meandered along the coral reef bordering the island. St. Croix, an island with many activites that appeal to all visitors, offers duty free shopping, water sports, golf, tennis, sightseeing and more. You can play as much or as little as you wish, be on the go every minute, or just kick back and soak up the relaxing island way of living, commanding the moko jumbies, portrayed by costumed young people who dance on oversized stilts to ward off evil spirits. Thank you for the incredible memories! 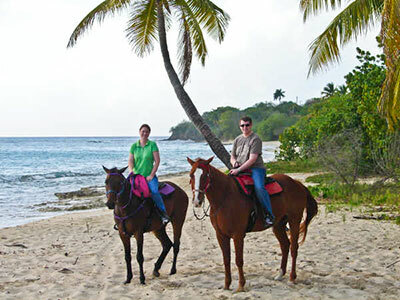 Your horseback riding adventure was definitely a highlight of our trip and made St. Croix one of our favourite ports! Rachel talks everyday about Mr. McGregor and Buddy and I still can't get over Sushi. Out of my 35 years of riding horses off and on, Sushi is the most memorable as the smoothest, best ride of my life! If we ever make it back to St. Croix, you will be my first call. This is Tiffani, I did a ride with Jill in March 2009 with my friend Heather and we had a BLAST. Though it is way late, here are just a few of the great pictures as promised ;) Hope you enjoy ! Thank you again for an amazing ride and an amazing experience!!! I would recommend it to anyone who goes there. It was incredible. We had a wonderful time on your trail/beach ride last Saturday. The scenery was just gorgeous and Jill was so much fun as our guide. We hope to bring our kids back someday to experience a ride as well. P.S. The Sunset Grille was a blast too! My dream has always been to ride a horse on the beach. Dream fulfilled!! It was the best guided trail ride I have ever been on! And I've been on a lot. The use of the microphone so everyone could hear what you were explaining is very thoughtful. You put my husband right behind you because he doesn't have much experience at all and has never done any more than a walk on horseback. You made him feel very safe and comfortable throughout the entire ride. He absolutely loved the trotting and cantering and now wants to try riding some more here at home. I also appreciate the fact that you stopped mid ride after the beach pictures to check the girths of the horses. It shows how much thought you put into safety - not only your horses but also your riders. Most all trail horses are the same - follow the leader and ignore the rider's commands. Sushi, however, was the best trail horse I've ever ridden. He was very responsive to every command I gave. I loved him!! It was an incredible experience and we would definately do it again if and when we return to St. Croix. It's such a beautiful island and to see it on horseback lets you see it from a different angle. Thanks for all you do and keep up the good work! My husband and I participated in your Friday 10:30 AM trail ride on Feb. 24th. I had the pleasure of riding Sushi! We are now back in New York freezing! First, I'd like to tell you how pleased I was to see such a group of happy and healthy horses! I was delighted to witness Paul adding an extra saddle pad on one horse because as Paul said, he often has to carry the heavier customers. 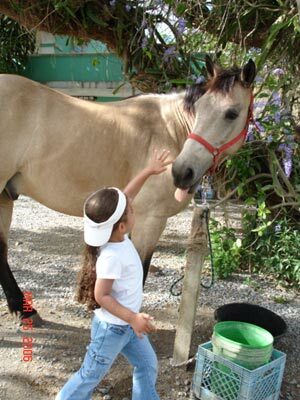 I was very impressed that your first concern was always for your horses' comfort and well being. I am sure one of the reasons that Sushi was more relaxed the morning I rode him, was because you took the time to switch the rein from the curb to the snaffle ring on his bit. On several vacations in the past, I have arrived at a stable to go on a trail ride, but decided not to go along because the horses seemed underweight, overworked, and unhappy. All of your horses are happy, fit, and healthy. You also did a wonderful job of initiating beginner riders. I loved that each rider had an opportunity to feed their mount by hand before the ride! Thank you again for an enjoyable trail ride. It was a delight the entire ride, from the forest to the beach and back again. I look forward to visiting St. Croix again next year. See your then. 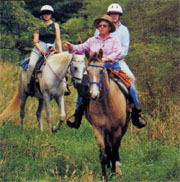 My wife and I wanted to send you a thank you letter saying how much we enjoyed our horseback riding trip with you. 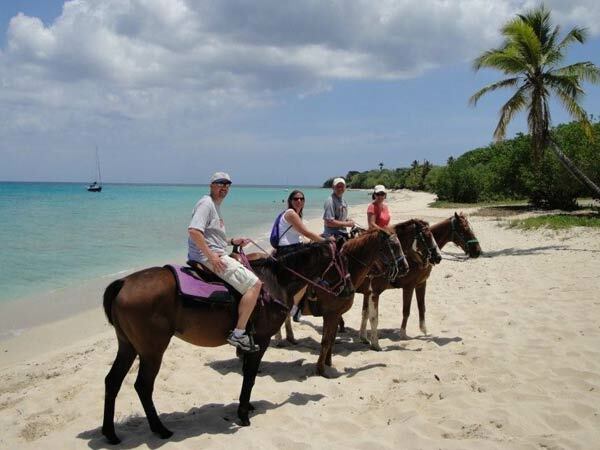 We were in St. Croix for our wedding and honeymoon for three weeks in May and coming horseback riding with your establishment made our time there all the more special! Neither of us had been horseback riding before so we also appreciate your patience and teachings. We both still miss Mr. McGreggor and Sancho! Now that wer are back in Chicago, we are looking into taking further lessons and horseback riding trips, we enjoyed our time with you that much! Also, thank you so much for being an establishment that truly takes care of their animals. My wife and I are very much supportive of the ASPCA here in the states and appreciated seeing your animals were happy and healthy! P.S. If we ever come back to St. Croix, we'll come and see you again! My wife and I went riding with you on 8 May, 2009. We had a wonderful time. We have been on many rides through the years and this was the best yet. 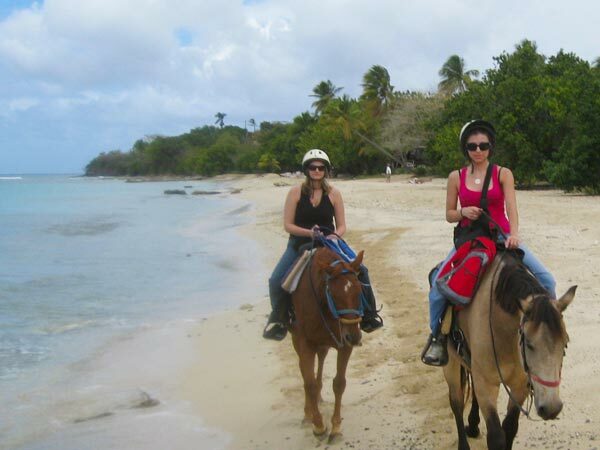 We enjoyed the canter through the rain forest and riding on the beach was unbelievable. Hope all is well. Just wanted to share our great thanks for the awesome tour we experienced last week Saturday. 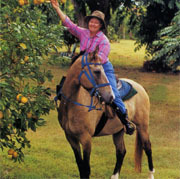 Jill was so wonderful, sweet and very knowledgeable, and what nice horses you've got! It's quite evident how dedicated you both are at taking good care of the horses. They're gorgeous, friendly and very healthy! Chlo� and I had a great time, and will definitely be returning soon :-)! I attached some pictures for your to enjoy as well. Please take note of the last one with Chlo� and Bucky, as he's sticking his tongue at her :-).